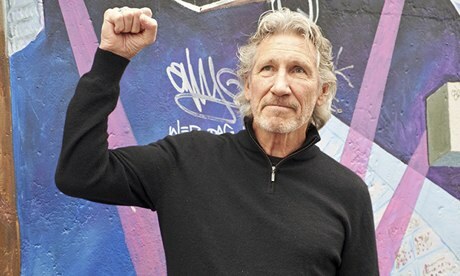 Inflammatory remarks by the musician Roger Waters, formerly of Pink Floyd, comparing the modern Israeli state to Nazi Germany have put him at the centre of a furious dispute. Performers and religious figures reacted angrily to the veteran rock star’s argument that Israeli treatment of the Palestinians can be compared to the atrocities of Nazi Germany. “The parallels with what went on in the 1930s in Germany are so crushingly obvious,” he said in an American online interview last week. Waters, 70, a well-known supporter of the Palestinian cause, has frequently defended himself against accusations that he is antisemitic, claiming he has a right to urge fellow artists to boycott Israel. This summer he was criticised for using a pig-shaped balloon adorned with Jewish symbols, including a Star of David, as one part of the stage effects at his concerts. Waters countered that it was just one of several religious and political symbols in the show and not an attempt to single out Judaism as an evil force. Now leading American thinker Rabbi Shmuley Boteach has raised the stakes by describing Waters’ views as audacious and clearly antisemitic. Writing in the New York Observer, the rabbi said: “Mr Waters, the Nazis were a genocidal regime that murdered six million Jews. That you would have the audacity to compare Jews to monsters who murdered them shows you have no decency, you have no heart, you have no soul.” The rabbi was responding to Waters’s latest comments on the Middle East. Speaking to the leftwing CounterPunch magazine, the musician criticised the US government for being unduly influenced by the Israeli “propaganda machine”. Speaking from New York on Saturday night, Waters strongly rejected Rabbi Boteach’s characterisation of his views. He said: “I do not know Rabbi Boteach, and am not prepared to get into a slanging match with him. I will say this: I have nothing against Jews or Israelis, and I am not antisemitic. I deplore the policies of the Israeli government in the occupied territories and Gaza. They are immoral, inhuman and illegal. I will continue my non-violent protests as long as the government of Israel continues with these policies. “The media in Israel flock to foreign entertainers. Performers would have the opportunity to make their viewpoints known – and it will also help to break the logjam that fundamentalists have had on both sides,” she argued. Mort supports the anti-boycott approach of Israeli singer and activist David Broza, whose forthcoming album East Jerusalem/West Jerusalem features covers of songs that urge understanding, including Waters’s own song Mother, from the album The Wall. Last week Waters’s words drew a strong response from the Community Security Trust, the body that monitors anti-Jewish activity in Britain. A spokesman told the Jewish Chronicle that Waters’s comments “echo the language of antisemitism” and added that the musician was “living proof of how easily people who pursue extreme anti-Israel politics can drift into antisemitic statements and ideas”. In August Waters used his Facebook page to respond to allegations that he was an “open hater of Jews”, made by Rabbi Abraham Cooper of the Simon Wiesenthal Centre in an interview with an American weekly Jewish newspaper, the Algemeiner. “Often I can ignore these attacks, but Rabbi Cooper’s accusations are so wild and bigoted they demand a response,” Waters wrote, adding that he had “many very close Jewish friends”.